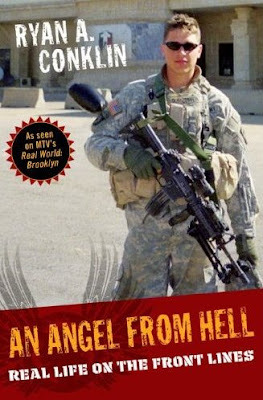 When I learned that author Ryan Conklin would be doing a book signing event in New York City for his An Angel From Hell, I knew I really wanted to do what I could to be there. As I reported earlier, Ryan had become the first hero I ever had, and the chance to meet and converse with one’s hero face-to-face isn’t a situation that necessarily happens everyday. There had only been one other such event with Ryan that was open to the general public, and I couldn’t know if this one might be the only opportunity remaining. It’s not like a situation of missing a performance of a star who has multiple concerts and tour dates, where if you miss one event you can just go to the next one. The basis of having a new book for sale made the schedule of these events limited to a short period of time. Two of them might be all that there were. I wasn’t able to go to the first Ryan Conklin event (in Annapolis, MD) and so I was determined to go to the second. Fortunately, I was able to get the two days off work that I would need to travel to New York. I used Expedia to find a deal on airfare + hotel, although the room rate was still more than I had ever paid for a hotel anywhere in the world. I booked for three nights on through the weekend to combine some sightseeing with the main purpose of the trip. On the morning of the event, I flew a non-stop to LaGuardia. I had been excited about the trip in the days leading up to it, but as the plane made its descent into the NYC area, it started hitting me that in a few minutes I was actually going to be in the same city as Mr. Conklin. Granted, the city was the New York mega-metropolis, so it didn’t really mean anything. But still, the thrill was electric. From the airport I took a shuttle van into the city. I had been to NYC once before, so I didn’t have the first-timer’s need to look for landmarks. Instead, once we were in Manhattan I scanned the faces of the people on the street, looking for celebrities. I didn’t know if one of them should happen to be Ryan if I would necessarily realize it was actually him. It’s a different experience to see someone in real life than it is to see them on television. I did see someone who could have been Woody Allen, but perhaps it was just an old man. I arrived at my hotel, checked in, and then got some nearby fast food. Afterward I did a long hike through Times Square, Grand Central Station, and Rockefeller Plaza. The purpose of the walk was to see those sights, but I still scanned the crowds in case I might serendipitously spot Ryan or some other noteworthy personage. It happened to be Fleet Week, so I did some groups of Navy guys walking around. However, they all seemed to be out of shape officers, so they weren’t as interesting to view as much as they were just obstacles at street corners to walk around. I went back to my hotel and did my final planning for Ryan’s event that night at the Barnes & Noble at 82nd & Broadway. Besides choosing what to wear, I also had to decide whether or not to buy another book for the purpose of having it signed. I hadn’t brought my copy from home because I didn’t want to tote it, and it would have felt strange taking a book I bought somewhere else into a bookstore. I tried to be logical about it, and in the end decided not to buy another book. 1) I already owned both a hardback and an audio. 2) I hate to pay full price for anything. 3) I already have handwritten letters from Ryan, so a signature wasn’t something I didn’t already have. The other thing to make a final decision on was how to get there. The store was close to a subway stop, but I hadn’t learned how to use the subway yet and didn’t feel like learning how that night. Also, it would be nighttime on the way back and I didn’t know how safe it was. I could see that the bookstore was only two miles from my hotel, so I decided just to walk there and back. If nothing else, I could see some more New York streets as well as the outside of the Lincoln Center. I started out and quickly realized that the rushing of New York pedestrians is greatly exaggerated. I found myself going at a much quicker clip than they were. The problem was that there were so many of these human speed bumps that they slowed me down so that the light at each street corner would turn red just as I got there. Very annoying. Eventually I got to the store. I could see right away that there were big posters in the window and in the entranceway announcing that Ryan A. Conklin would be there that evening. It was almost too much to take in that I was really there and in just a short while I was actually going to be able to see him in person. I took a deep breath and pushed forward, telling myself, this is it. Trying to keep my nerves in check, I entered the building and hoped for the best.